F. Walter 85. / Edwards 26., Grainger 63., Haynes 69. 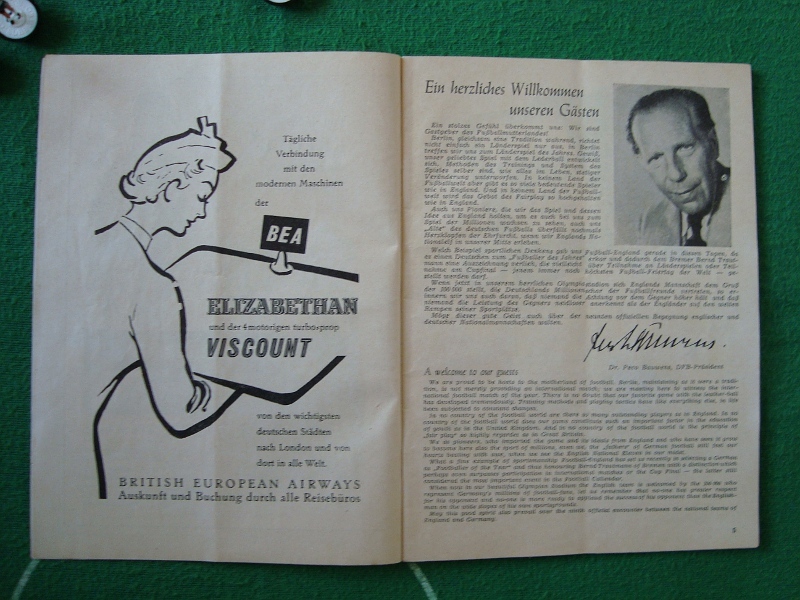 The fifty-page official match programme from the May 1956 friendly international fixture between Germany and England was a compact, information-packed publication priced at 30 Pfennige. 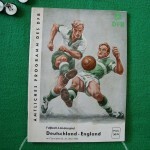 The cover illustration is an artistic impression of a German player being challenged by an opponent in green and white kit. After the introduction, which includes a welcome statement in English, by DFB President Dr. Peco Bauwens, there are further pieces by the mayor or Berlin and the head of the Berlin Football Association. The programme is packed with interesting articles and features including a history of the fixture, detailed pen-portraits of both teams, and a fascinating facsimile of the amateur international played between the two teams at Oxford in 1909. 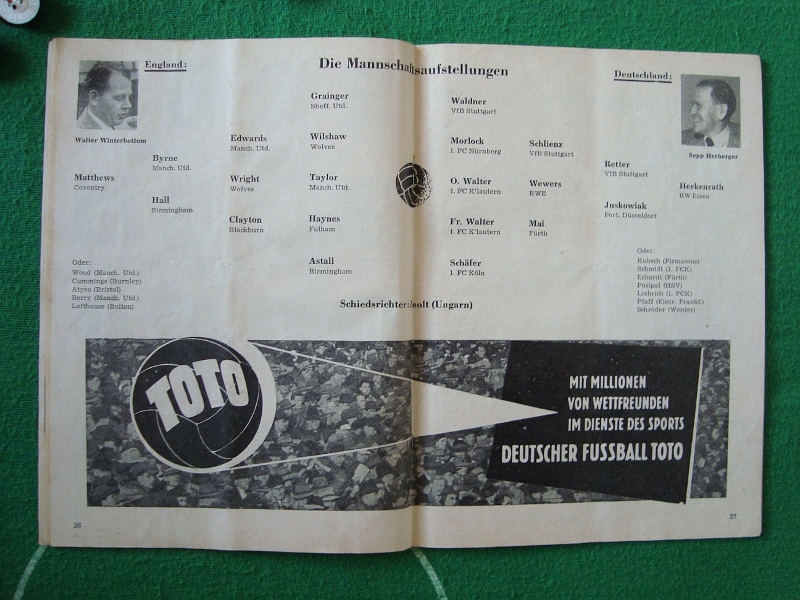 The Germany team that lined up in Berlin’s Olympiastadion against England in May 1956 only contained one member of the eleven that had played at Wembley less than two years earlier – goalkeeper Fritz Herkenrath. Having to battle with retirements, injuries and constantly rejigging the team, the German team was a mere shadow of the squad that had triumphed two years earlier in the World Cup. As reigning world champions the reputation of the German team had risen, and with it the level of expectation placed on the coach and the players; in a way, the victory in Bern had become something of a burden – something that badly affected the team in the years that followed. The Nationalmannschaft’s record since that historic afternoon in Bern was not exactly one of a team that still held the title of world champions: in the remainder of 1954 they had lost all three of their fixtures, 1955 had witnessed a win-draw-loss record of 2-0-4, and the first match of 1956 had produced a 2-1 home defeat to the Netherlands. In all, Herberger’s side had played a total of eleven games since the World Cup final, losing eight of them. A number of the winning 1954 squad had since returned to the fold including the Walter brothers, Max Morlock and Hans Schäfer, but the suggestion was that many of these players were there not on current form but past glories – in addition to the fact that many of the potential replacements were simply not quite up to scratch. 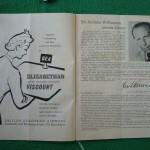 Moreover, while most of the 1954 front line had returned – with the exception of “The Boss”, Helmut Rahn – the experienced defensive trio that had played at Wembley were not in the 1956 squad; their replacements however were not even untried youngsters as had been the case with the one-cap offensive quintet of 1954, but second-string journeymen at the ends of their careers. Among the defensive unit that took to the field in Berlin were the thirty-one year old Erich Retter and thirty-two year old – and one-armed – Robert Schlienz, both of whom would be playing their last international match. 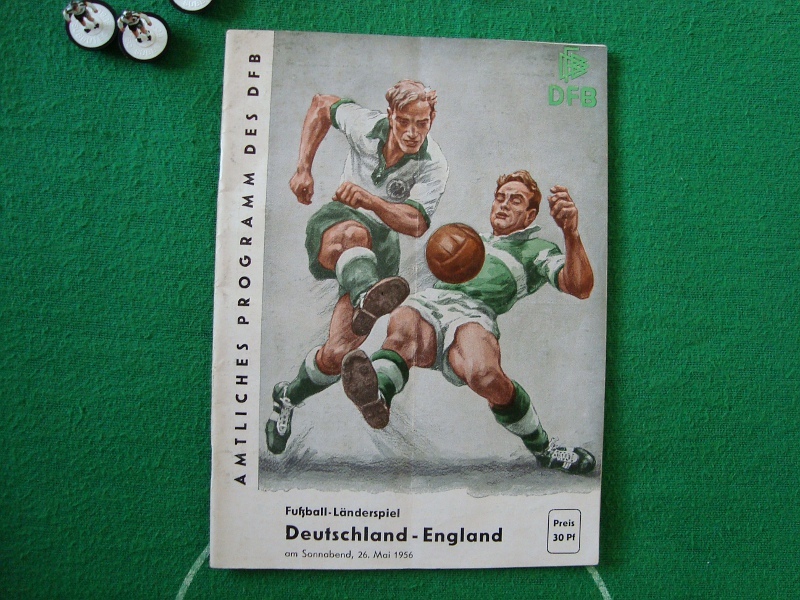 Given their dismal run of form, it could be argued that Germany came into the 1956 match against England in an even less healthy state than they had done at Wembley eighteen months earlier. With the exception of the twenty-three year old midfielder Erwin Waldner, there weren’t even any promising young players in the starting eleven, which had an average age of just under thirty. 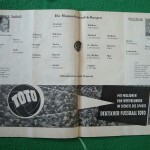 Walter Winterbottom’s England side also had a new look it, with only skipper Billy Wright and Manchester United defender Roger Byrne making the line up from those that had played at Wembley. However unlike his German counterpart Winterbottom’s attention was now firmly focussed on a number of exciting youngsters, including twenty-one year old Fulham playmaker Johnny Haynes, twenty-two year old Sheffield United outside-left Colin Grainger and the man seen by many as the shining future light of English football, the dynamic nineteen year old Manchester United winger Duncan Edwards. After Germany had set the pace for the opening quarter, it was that man Edwards who set England on their way with a goal of breathtaking quality. With twenty-eight minutes gone, the teenager charged through the German defence like the proverbial knife through butter before slipping the ball easily past Herkenrath from the edge of the eighteen-yard box. Having gained the lead England started to play with growing assurance, but like Wembley two years before they couldn’t add to their advantage, going into the half-time break with a one-goal lead. Having overcome the shock of falling behind Herberger’s side slowly started to come back into the game, with England ‘keeper Reg Matthews making an excellent save to deny Ottmar Walter. The German pressure alas came to nothing, and as is nearly always the case in this wonderful game called football the game was more or less over in the blink of eye. With sixty-minutes on the clock Grainger had ghosted past a static Heinz Wewers before blasting the ball past Herkenrath, and a mere six minutes later Johnny Haynes picked up a sublime through-ball from Dennis Wilshaw before caressing it past the helpless German ‘keeper. In what had been a blisteringly hot afternoon, it was an ice-cool finish. With the visitors three goals to the good there was little left for Germany to play for but pride and respectability, and they continued to press forward rather than simply keep their opponents’ score down. With five minutes left they finally got on the scoreboard, with skipper Fritz Walter – at thirty-five the oldest man on the pitch – capping off a fine move that included fellow World Cup winners Karl Mai and Hans Schäfer. So as had been the case at Wembley, the final score finished 3-1 to England. With the World Cup finals in Sweden just over two years away Germany were looking far from convincing, and many commentators had written off their hopes already. England meanwhile were seen as possible winners of the tournament – with those tipping them for success including none other than Nationaltrainer Sepp Herberger. Nobody could ever have predicted how things would turn in the intervening two years: Germany from somewhere managed to find their now legendary tournament form to come within a whisker of making their second successive World Cup final, while a distinctly unimpressive England found themselves being eliminated at the first hurdle after failing to win a game. Things were not as simple as that, however – just months before the tournament was to begin in February 1958 the Manchester United team were on their way back home from a Champions’ Cup tie in Belgrade. Having stopped in Munich to refuel, the pilot attempted to brave the tricky conditions in taking off – resulting in an horrific crash that took the lives of twenty-three people, which included eight of the famous “Busby Babes”. Among those eight players were four of United’s young England internationals – Roger Byrne, David Pegg, Tommy Taylor and the young diamond – Duncan Edwards. Home: played 6, won 0, drawn 2, lost 4. Goals for 10, goals against 22. Overall: played 9, won 0, drawn 2, lost 7. Goals for 11, goals against 37.